Kiteboarding combines wakeboarding or surfing with sailing and paragliding. It’s a fun and addictive combination that will give you a great workout. Kiteboarding is a great workout with a solid calorie burn. The rider steers the kite with a control bar as the kite pulls the rider through the water. Kiteboarding, also called kitesurfing, is a relatively new sport that is becoming increasingly popular. While many consider it to be an extreme sport, it is becoming more mainstream. In fact, it will soon become an Olympic sport, replacing windsurfing at the 2016 Rio de Janeiro Olympics. Kiteboarders uses large kites to pull them through the water on a kiteboard. It’s similar to wakeboarding or windsurfing, except that the power is provided by a kite instead of a motor boat or sail. The kite has long lines that attach to a special harness worn by the rider. The rider controls and steers the kite using a special control bar attached to two of the lines. On a windy day, the kite generates enough power to pull the rider out of the water and ride his or her board, skimming along the surface like a water skier, wakeboarder, or windsurfer. Many kiteboards like to catch and ride waves (called kitesurfing) or pop off the water to perform tricks. It’s not uncommon to fly 10 to 15 feet or more above the water. 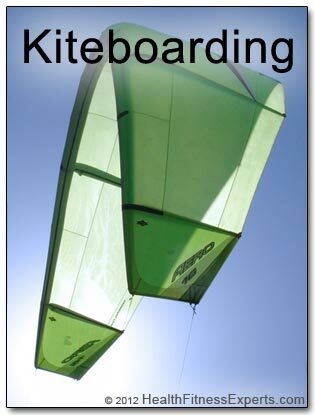 What is a Kiteboarding Kite? The kites used in kiteboarding belong to a class of kites called power kites. Typical kites range in size from 5 to 18 square meters. The size of the kite used depends on the wind speed and weight of the rider. The stronger the wind or the lighter the rider, the smaller the kite. A kiteboarding kite is not like a traditional kite. It’s more like a giant wing. It’s made of Dacron (sail cloth) and ripstop polyester, and it gets its shape from inflatable vinyl tubes that are sewn into the leading edge and struts of the kite. These vinyl tubes can be easily inflated and deflated, allowing the kite to be folded up and stored in a backpack for transportation to and from the water. And since part of the kite is inflatable, it won’t sink if it crashes into the water. A kiteboarding kite is made of Dacron, ripstop nylon, and inflatable vinyl tubes that give it its shape. How Do You Control the Kite? The kite has either four or five lines, about 75 -100 feet (23 -30 meters) long. Two lines, called the power lines, run from the leading (front) edge of the kite and are attached to a special kiteboarding harness worn by the rider. Two other lines, called the control lines, run from the back of the kite to either side of a control bar that the rider uses to steer the kite. Some kites have a fifth line that can be used as an aid to relaunch the kite if it crashes, or as a safety mechanism during an emergency. The power lines run through a hole in the center of the control bar. As the rider pushes the control bar towards or away from himself/herself, the angle of the kite (the “angle of attack”) changes and the kite flies up or down, pulling the rider with more or less force. If the rider pulls one side of the bar the kite turns in that direction, as that side of kite is pulled down and the other side goes up. In this way, the rider can control both the power and the direction of the kite. Kiteboards look similar to boards used in other water sports, but they are specialized for kiteboarding. Typically they have foot straps that allow the rider to slip their feet in and out. This allows them to ride the board attached to their feet, but also allows the board to pop off during an unintentional fall or an intentional trick. Some advanced kiteboarders ride “strapless,” meaning that they use a board with no straps and keep the board on their feet with only friction, like a surfer. Boards come in two main types: wake style and surf style. Wakeboard style boards are very similar to boards you would use wakeboarding behind a motor boat. But kiteboards usually have different types of foot straps, and their shape varies to meet the needs of being pulled by a kite instead of a wakeboarding or water ski rope. Kiteboarding surfboards are very similar to traditional surfboards used by surfers. But they are typically shorter and they often have foot straps. Surf-style boards are often used on days when the wind is light, because they are very buoyant, allowing riders to stay above the water with less power. Of course, surf-style boards are also used to surf waves. This style of kiteboarding is often called kitesurfing. Kiteboarders call time spent on the water a “session.” Depending on the kiteboarder and the conditions, a session may last several hours. And, it’s a great workout! 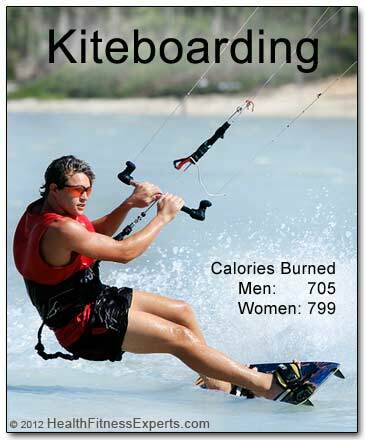 So, how many calories will you burn kiteboarding? French researchers actually studied that question! They found that an average person will burn about 750 calories per hour kiteboarding in light wind (12 -15 knots) conditions. But as with all workouts, the actually calories burned depend on your gender, weight, height, and age. The table below shows more specific calorie counts for men and women based on average height and age. 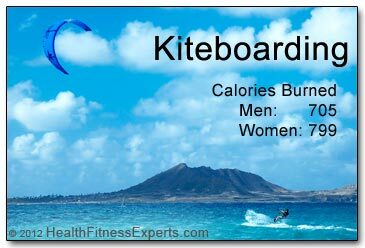 * Calorie burn assessed kiteboarding in wind speeds of 12 – 15 knots. Based on MET values from the “2011 Compendium of Physical Activities”, adjusted using the Harris Benedict equation for estimated RMR. Kiteboarding is a fun and addictive sport that also gives you a great workout. This rider is enjoying a beautiful day off of Kailua Beach in Oahu, Hawaii. Kiteboarding is fun and addictive. Kiteboarders say that once you feel the pull of the kite, you’re hooked and you’ll never be the same. You become obsessed with watching the wind (and wind forecast), and every time you see a body of water you think, “Can I kite there?” And in addition to enjoying the outdoors and the water, you’ll get a great workout. So go fly a kite! Do you kiteboard? What’s your favorite spot? Do you want to learn? Have any questions? Let us know by leaving a comment below. McDowell, Margaret A., et al. National Health Statistics Report: Anthropometric Reference Data for Children and Adults: United States, 2003–2006. National Center for Health Statistics. Centers for Disease Control Prevention. United States Department of Health and Human Services. Laboratoire Handibio, groupe Mouvement altéré et efficience énergétique, UFR STAPS, Université de Toulon-Var. France.